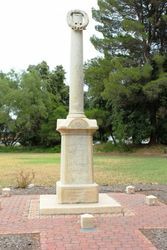 A monument erected by the women of Port Pirie commemorates those who died in service or were killed in action in World War One. His Excellency the Governor and Lady Bridges, attended by Captain Duncan (private secretary), arrived here on October 14 from Adelaide. They were met by the Mayor (Mr. J. C. Fitzgerald, J.P.), and hearty cheers were given by the big crowd which lined the street. Mr. A. W. Lacey, M.H.R., Councillors Afford, Clark, Day, and Cockburn, and the town clerk (Mr. E..E. Garrett) were introduced, and a move was then made to the children's playgronnd, the site chosen for the official welcome ceremony. On the way the motors were stopped at the recreation ground to enable the visitors to inspect the memorial gates and honor roll. 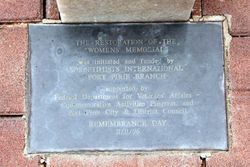 After official addresses, then came the ceremony of the unveiling of the women's memorial to fallen soldiers, erected in the Soldier's Memorial Park. 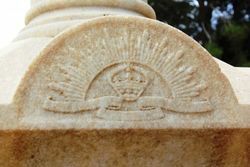 The memorial, of Angaston marble, takes the form of a tall, broken column, supported by a large square pedestal. 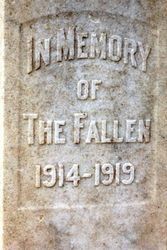 The latter bears the inscription, "In memory of the fallen ,1914-1919. 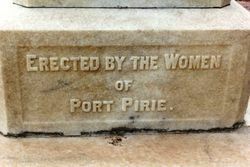 Erected by the women of Port Pirie." Formed up near the memorial under the command of Captain Hobbey, were 18 members of the Ellendale Troop of Girl Guides. The Mayor, on behalf of the Women's Memorial Committee, asked Lady Bridges to unveil that beautiful tribute to the memory of the sacrifice made by many brave men who had gone from that district to the war. Chronicle (Adelaide), 18 October 1924. ERECTED BY THE WOMEN OF PORT PIRIE.